June 2017: Watts up with Lumens? Surprisingly, the tried-and-true wattage measurement we were all using to shop for light bulbs really wasn’t telling us about the most important aspect of the bulb – how much light it puts out. Watts measure how much electricity is used by the bulb, not the bulb’s light output. However, for years, this wattage measurement was sufficient for determining which light bulbs to purchase. This is because the light output from incandescent bulbs is so similar across the board, it was easy to connect the wattage of a bulb with about how bright the bulb would be. Today, we are faced with more options in light bulbs, from halogen incandescent, to CFLs to LEDs. These newer bulbs require less energy to produce the same amount of light, so wattage is no longer a reliable way to gauge the brightness of a bulb. This is where lumens come into play. Lumens are the measurement of the amount of light put out by a bulb. A standard 60-watt incandescent bulb produces around 800 lumens of light. For an LED to produce about the same amount of light, only 9 watts are required. While this seems tricky, it’s not as difficult as it sounds. 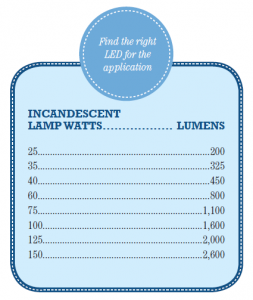 Use this helpful visual, provided by the American Lighting Association’s Lighting Planning Guide, produced with Bravo Business Media, to determine how many lumens you need in order to match the wattage of your traditional incandescent bulb. For more help determining what kind of lightbulb is perfect for your home’s light fixtures, the Hortons team at each of our three Chicagoland locations are happy to answer any of your questions.